A comprehensive Australian migration service to guide you through the entire process. Lodging a visa application with the Australian immigration authorities can be a complex and time consuming undertaking. The Online Migration Service is intended for candidates who require extensive assistance with their Australian visa application. Before assisting with your visa application we ask that all prospective applicants complete the appropriate Australian visa assessment. Details gathered in the assessment will help us ascertain whether you qualify for a visa. After careful consideration we proceed to lodging the visa application on your behalf. While your application is being processed we continue to liaise with the Department of Home Affairs and provide support when needed. Australian visa assessments are free-of-charge. There’s no compulsory service or obligation attached to this service. We offer our visa assessments as the first port of call to help assess your eligibility and help gauge your interest in our migration services. If you qualify for a particular visa, we’ll let you know by outlining the process in our assessment letter. From there it’s up to you to decide the type of service that’s suitable for you. We are a specialist Australian migration practice. We have over 7 years’ experience in assisting families, couples, individuals and businesses with their migration requirements. We have been registered with the Office of the Migration Agents Registration Authority (MARA) since 2008. The MARA is a government body that regulates migration agents operating in Australia. With our client based scattered across the globe, we recognise the importance of remaining flexible to help assist our clients wherever they are. 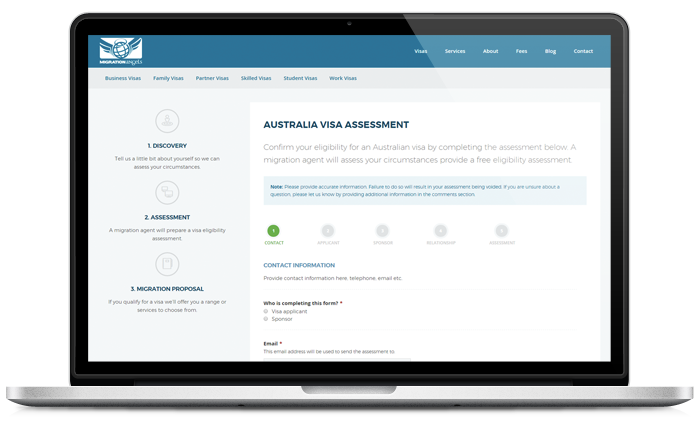 To determine your eligibility for an Australian visa, simply select the most appropriate visa assessment from the menu options below. The visa assessment should only take about 5 minutes to complete. If you need to return to your assessment at a later time, you can save your progress. If you qualify for a visa we will prepare a visa assessment report and offer a range of services to help you get through the application process.